The SER1CH-UA-1in is recommend for new designs. The SER1CH-UA-BANA is a 1 channel, 24 bit realtime continuous data acquisition system with a very low power consumption of 600 microamps. With banana jacks, it is well suited to benchtop applications. 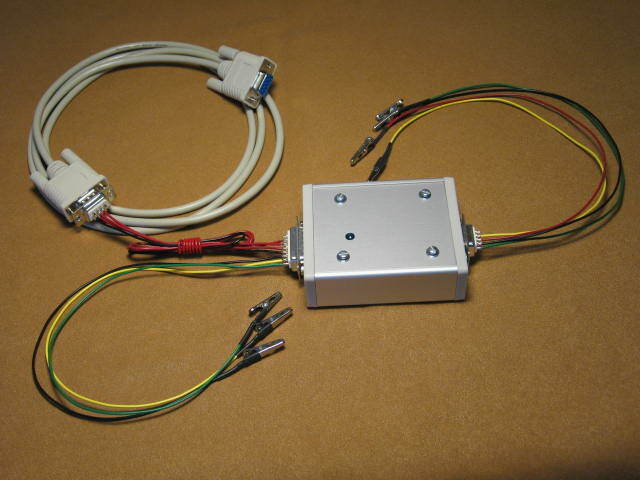 Other models differing only in their shape and connectors include the SER1CH-UA-DSUB with D-shell connectors for industrial connections and the narrow SER1CH-UA-1in with right angle headers. Suitable for use with potentiometers and other ratiometric applications, a buffered copy of the A/D reference is provided for sensor excitation. The systems samples at 1Hz with a full scale input voltage range of 0 to 5 volts. 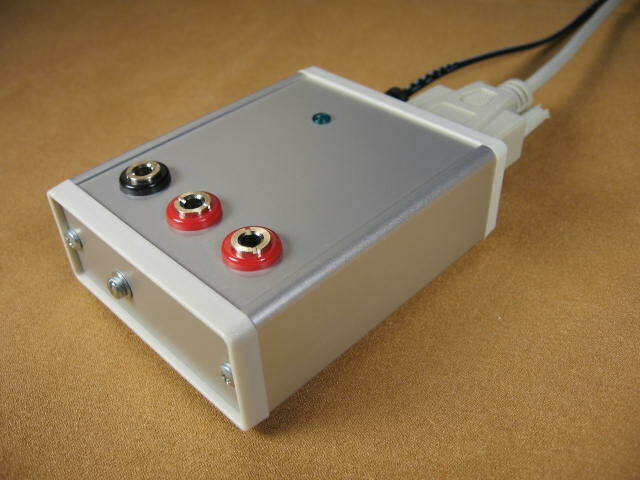 Sitting outside of the PC for improved noise performance, it comes in a sturdy anodized aluminum case, communicating acquired data to the PC using a standard RS232 serial port. A full featured DVM acquisition and display program is included with the system software, so you can be up and running immediately and continuously saving acquired data to disk. For developing custom applications, low level functions for controlling the system are supplied as static and DLL libraries. Windows and Linux software is provided with source code included. The bundled "in the box" system comes with all the accessories you need to start acquiring data immediately. These include software, PDF User Manual, 9 VDC power supply, 6' RS232 serial cable, banana jack to alligator analog input cables, and desktop enclosure. The SER1CH-UA-DSUB is a 1 channel, 24 bit realtime continuous data acquisition system with a very low power consumption of 600 microamps. With D-shell connectors, it is well suited to industrial applications. Other models differing only in their shape and connectors include the SER1CH-UA-BANA with banana jacks for quick connections and the narrow SER1CH-UA-1in with right angle headers. The bundled "in the box" system comes with all the accessories you need to start acquiring data immediately. These include software, PDF User Manual, 9 VDC power supply, 6' RS232 serial cable, D-shell cables for analog input (male DB09 to alligator clips) and power/RS232 (female DB15 to 2.1mm power jack and female DB09 RS232), and desktop enclosure. 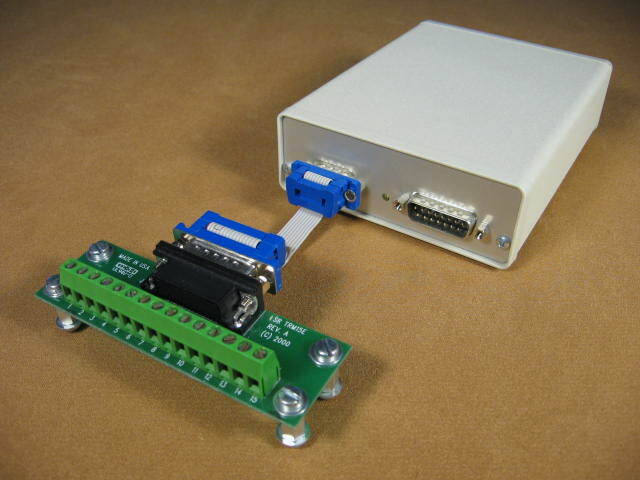 The PAR1CH is the 1 channel member of the PARxCH family of 24 bit realtime continuous data acquisition systems. It offers a low cost way to begin using 24 bit technology with all the capabilities of the 4 and 8 channel systems. For the PAR1CH 24 bit A/D, highest resolution occurs at 10-1000 Hz, with maximum sampling rates of 5 kHz sustained. The PAR1CH analog input is differential with an amplitude range of +/- 10 volts. The on board 2 Mb DRAM allows continuous no loss data acquisition even on heavily interrupted and multitasking PCs. The PAR1CH sits outside the PC for improved noise performance and communicates its acquired data using the standard PC parallel port. A full-featured acquisition and display program is included with the system software, so you can be up and running immediately; controlling acquisition rates and continuously saving acquired data to disk. For developing custom applications, low level functions that control the PAR1CH are supplied as static, DLL or shared libraries. Full source code is included and the PDF user manual contains circuit diagrams. The 2 MB DRAM data buffer acts as a back up to make sure data is not lost even if the PC is interrupted for long periods on other tasks. There are no "fall through" times or buffer latencies. As soon as any data is ready from the PAR1CH, the PC is notified so it can get the data. Any additional data that comes in while the PC is getting around to servicing the PAR1CH is simply stored up. With 2 MB of buffering at 10 Hz sampling, you have more than 4 hours of back up, with proportionally shorter times at higher frequencies. These times are more than enough to satisfy typical PC latencies. The PAR1CH comes with all the accessories you need to start acquiring data. These include software, manual (PDF), 9 VDC power supply, 6' parallel port cable, TRM15E 4 channel terminal board, and desktop enclosure. The USB4CH is recommend for new designs. The PAR4CH is the 4 channel member of a family of 24 bit realtime continuous data acquisition systems with an individual A/D per channel architecture. 1 and 8 channel units are also available. For the PAR4CH 24 bit A/D, highest resolution occurs at 10-1000 Hz, with maximum sampling rates of 5 kHz sustained. All PAR4CH inputs are differential with amplitude ranges of +/- 10 volts. The on board 2 MB DRAM allows continuous no loss data acquisition even on heavily interrupted and multitasking PCs. The PAR4CH sits outside the PC for improved noise performance and communicates its acquired data using the standard PC parallel port. A full-featured acquisition and display program is included with the system software, so you can be up and running immediately; controlling acquisition rates and continuously saving acquired data to disk. For developing custom applications, low level functions that control the PAR4CH are supplied as static, DLL or shared libraries. Full source code is included and the PDF user manual contains circuit diagrams. The 2 MB DRAM data buffer acts as a back up to make sure data is not lost even if the PC is interrupted for long periods on other tasks. There are no "fall through" times or buffer latencies. As soon as any data is ready from the PAR4CH, the PC is notified so it can get the data. Any additional data that comes in while the PC is getting around to servicing the PAR4CH is simply stored up. With 2 MB of buffering at 10 Hz sampling, you have more than 4 hours of back up, with proportionally shorter times at higher frequencies. These times are more than enough to satisfy typical PC latencies. The PAR4CH comes with all the accessories you need to start acquiring data. These include software, manual (PDF), 9 VDC power supply, 6' parallel port cable, TRM15E 4 channel terminal board, and desktop enclosure. 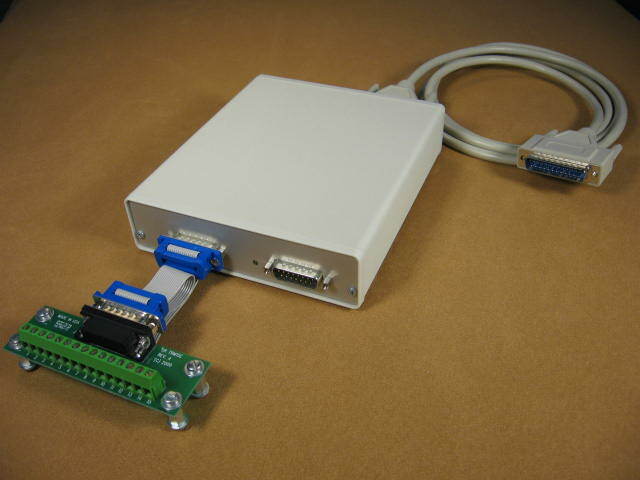 A PC104 adapter plate can be substituted for the desktop enclosure at no additional charge. The USB8CH is recommend for new designs. ** Improved feature available on PAR8CH only. The PAR8CH is the 8 channel member of a family of 24 bit realtime continuous data acquisition systems with an individual A/D per channel architecture. 1 and 4 channel units are also available. For the PAR8CH 24 bit A/D, highest resolution occurs at 10-1000 Hz, with maximum sampling rates of 5 kHz sustained. All PAR8CH inputs are differential with amplitude ranges of +/- 10 volts. The on board 2 MB DRAMs allow continuous no loss data acquisition even on heavily interrupted and multitasking PCs. The PAR8CH sits outside the PC for improved noise performance and communicates its acquired data using the standard PC parallel port. Several features beyond those shared with the 1 and 4 channel PARxCH products are standard on the PAR8CH including improved digital I/O and GPS time stamping. While all three PARxCH can poll the digital inputs, the PAR8CH automatically samples the digital inputs each time a new analog data point is ready and includes the digital data in the regular data stream. The PAR8CH also has an 800 ns onboard counter that can be used in place of the PC's high speed counter when time stamping data with the PARGPS. This enhances accuracy since variation in PC interrupt latencies no longer influences the timing calculation. For all the PARxCH products, a full-featured acquisition and display program is included with the system software, so you can be up and running immediately; controlling acquisition rates and continuously saving acquired data to disk. For developing custom applications, low level functions that control the PAR8CH are supplied as static, DLL or shared libraries. Full source code is included and the PDF user manual contains circuit diagrams. The pair of 2 MB DRAM data buffers act as a back up to make sure data is not lost even if the PC is interrupted for long periods on other tasks. There are no "fall through" times or buffer latencies. As soon as any data is ready from the PAR8CH, the PC is notified so it can get the data. Any additional data that comes in while the PC is getting around to servicing the PAR8CH is simply stored up. With 4 MB of buffering at 10 Hz sampling, you have more than 4 hours of back up, with proportionally shorter times at higher frequencies. These times are more than enough to satisfy typical PC latencies. The PAR8CH comes with all the accessories you need to start acquiring data. These include software, manual (PDF), 9 VDC power supply, 6' parallel port cable, TRM25E 8 channel terminal board, and desktop enclosure. The PAR24B is an 8 channel, 24 bit realtime continuous data acquisition system with an individual A/D per channel architecture. With an individual A/D per channel you get high resolution on each channel with no channel to channel timing skew or crosstalk. For the PAR24B 24 bit A/D, highest resolution is in the 10-100 Hz range, with maximum sampling rates of 1 kHz. All PAR24B inputs are differential with amplitude ranges jumper selectable for +/-2.5 or +/- 10 volts. The on board SRAM FIFO allows heavily interrupted and multitasking PCs to finish any current processing before retrieving acquired data, resulting in continuous acquisition with no data loss. Sitting outside the PC for improved noise performance, the PAR24B communicates all of its acquired data to the PC using the standard EPP/BPP parallel port. A full-featured acquisition kernel and display program is included with this system so you can be up and running immediately. This program allows users to control acquisition rates and continuously save acquired data to disk. In addition, for those wishing to develop their own custom code and applications, low level functions for controlling the PAR24B are supplied as 16 and 32 bit DLLs and as National Instruments LabVIEW drivers. Full source code is included. Also, the PDF user manual contains circuit diagrams for hardware specifics. The PAR24B comes with all the accessories you need to start acquiring data. These include software, manual (PDF), a 4K FIFO, 9VAC power supply, 6' parallel port cable, an 8 channel terminal board, and a desktop enclosure. Separately priced upgrades to a 32K FIFO or a full size rack mount enclosure are also available. Board Dimension: 7" x 8"
Some users may want to consider these options, although none are necessary as the PAR24B will work fine in its standard configuration. The DSPA64/HLF combines an A/D converter board and a DSP coprocessor board to make a complete system for realtime continuous A/D acquisition and processing. The DSPA64 features a high resolution 16 bit A/D converter and a 64 channel programmable multiplexer array. Sampling at aggregate rates up to 138 kHz, all DSPA64 inputs are differential and buffered through a low noise precision instrumentation amplifier. In addition, overall gain and amplitude limits can be user set by resistors, with nominal values of +/-2.75 or +/-10.00 volts. 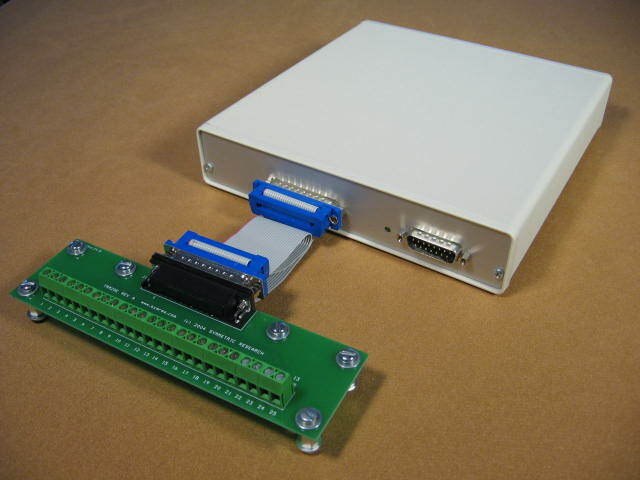 The DSPA64 sits outside the PC and uses a 16 conductor ribbon cable to communicate all of its acquired data in serial digital format to the DSPHLF card installed in an ISA slot inside the PC. Featuring a powerful 50 MHz Agere DSP32C floating point DSP processor, the DSPHLF card processes and buffers up to 1Mb of incoming DSPA64 data without any required PC time. Furthermore, double buffering provided by the DSP32C enables large blocks of data to continuously be saved to the hard disk. Data acquisition continues uninterrupted with no data loss while saving to disk. Because the PC is completing only disk saves, PC time is available for displaying graphics or running a windowed environment. Incoming data is processed up front by the DSP32C, enabling the user to apply digital filters to the incoming data in real time. For example, data can be over sampled and then smoothed to increase the effective resolution of the overall system. This powerful feature is further enhanced because DSPHLF programs are saved in the on board SRAM memory, and can be changed at any time by the user. This allows for modifying filtering coefficients and other parameters as necessary in real time. A full-featured acquisition kernel and display program is included with this system so you can be up and running immediately. This program allows users to specify selected channels, control acquisition rates and continuously save acquired data to disk. In addition, for those wishing to develop their own custom code and applications many tools are provided. These include an assembler and monitor debugger for the DSPHLF and low level functions for controlling the DSPA64 supplied as 16 and 32 bit DLLs and as National Instruments LabVIEW drivers. Many example programs, both Windows executables like Scope and LabVIEW VIs, are provided. Full source code is included. Also, the PDF user manual contains circuit diagrams for hardware specifics. The DSPA64/HLF comes with all the accessories you need to start acquiring data. 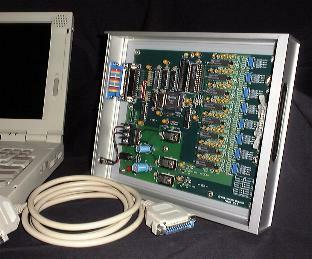 These include software, manual (PDF), triple output power supply, 7' ribbon cable, test leads, one 8 channel terminal board. A separately priced rack mount enclosure is also available. Board Dimension: 6.50" x 9.00"
Some users may want to consider these options, although none are necessary as the DSPA64/HLF will work fine in its standard configuration.